Appointed on 27 August by Greece’s President, Prokopis Pavlópulos, Ms. Vassiliki Thanou-Christophilou, President of the Supreme Court and mother of three, was sworn in on Thursday 28, August, 2015 as interim Prime Minister. She also served as President of the Electoral Court which oversees and examines the validity of parliamentary elections and referenda – including the legitimacy and strength of the 5 July referendum against more imposed austerity. As a fierce opponent of the troika imposed austerity, Ms. Thanou may be the new spark of hope for Greece’s future. She has openly opposed dictated wage cuts and an illegal property tax, introduced with the first bail-out package in 2012. The tax has already put many small entrepreneurs out of business and threatens more to follow, especially in Greece’s current economic downturn. In February this year she called on Jean-Claude Juncker, President of the EC, to help the “Greek people regain their dignity”. To no avail, as we know. Ms. Thanou clearly portrays a personality that is not scared of facing the monster in Brussels. And this is precisely what Greece needs in these coming months and years – projected time for recovery of national sovereignty, social justice and economic prosperity. (2) The people of Greece prefer to remain hostage to Mr. Tsipras smile, pep-talk and charisma – and to Madame Merkel. – But be sure – Mr. Tsipras personality and attitude towards more debt and more austerity will not change, nor will that of Angela Merkel. Why would Ms. Thanou not run for Prime Minister herself on 20 September, for example in affiliation with the new Unity Party, seeking a wider coalition with other leftwing parties? – And become the first ever elected female Prime Minister of Greece – a new face on the Greek horizon; a person reflecting integrity and who seems to understand the plight of the majority of the Greek people, a person not afraid of confronting Greece’s creditors. Having been on top of the Greek judiciary, Ms. Thanou knows that Mr. Tsipras’ actions against a 62 % majority of NO votes was anti-constitutional and can be undone by the Supreme Court. Ms. Thanou also is conscious that contracts – in this case contracts for debt – concluded under duress, coercion and corruption are illegal and won’t hold up in any international court of law. All but about € 50 billion of Greeks current external debt were ‘acquired’ under such fraudulent conditions, plus blackmail – the pressure ‘you accept our conditions, or we will force you out of the Eurozone, and possible even out of the EU’. – This is illegal. Hence, virtually the entire Greek debt could be legally erased and declared null. Although, information on the subject is contradictory, it appears that still a majority of Greek people would like to remain in the Eurozone. From recent travels through Greece, I understand it is mostly a matter of ‘prestige’ and ‘belonging to the West’. – What prestige? – What West? – The connection between fiat money, debt and becoming colonized by an internationally failing currency and it’s the predatory masters of the West in Brussels, Germany and Washington is not made. Much like the US dollar, the Euro is being produced electronically as debt. In the US if the FED (Federal Reserve or Central Bank, never mind its full private ownership) needs fresh money, to finance, say, a new Washington invasion, a new war or conflict towards ‘regime change, it produces a federal debt, called QE (Quantitative Easing). This is unviable debt held as reserve currency by treasuries around the world, losing with every new dollar being produced some of its value. According to Alan Greenspan’s (former FED Chairman) own admission, “The United States can pay any debt it has, because we can always print money to do that. So there is zero probability of default;” – But there is a gradual devaluation of the dollar and the foreign countries dollar reserves. This is not quite the case in Europe, where the European Central Bank is not really a central bank, but a watchdog loosely controlling Eurozone countries’ management of debt, but mostly working for TBTF (too-big-to-fail) banksters, Wall Street and their associates in Europe. In the US as in Europe, new cash is generated since the 1990’s Clinton era by fully deregulated private banks dishing out debt, including, for example, to countries like Greece, Spain, Italy, Portugal — you name it. In fact to any country which still has a social system that can be plundered. So – France may be one of the next candidates. Western banks are all ‘globalized’. There is not much Germany left in ‘Deutsche Bank’. But they all benefit from borrowing practically unlimited sums from their respective central banks at zero or almost zero interest and onlend the funds to, say, Greece at between 5% and 7% – with the pretext that Greece is a high-risk case, well aware that risks are covered by risk insurers and eventually by ‘bail-ins’ or ‘haircuts’. The interest difference is sheer profit. Effective since August this year the unelected EC has issued an edict that spares tax-payers from saving banks which over-stretched and over-speculated themselves into bankruptcy. Instead, the new system allows such banks to refinance themselves by virtually stealing the money from their depositors and shareholders, the so-called ‘bail-ins’. The masters of finance make sure this new rule – illegal by any traditional international standard – is hardly known to the public, lest a run on the banks might become imminent. The Euro itself is since its inception a highly vulnerable currency. It is almost a miracle that it lasted for 15 years. The imposition of a common currency on a set of nations, most of which have hardly anything in common, other than the Washington imposed NATO, is an economic absurdity. Such a shared currency based on a relatively loose association of independent countries – the EU – with no common constitution, let alone a joint political agenda and which are consequently devoid of solidarity that would emanate naturally from an entity of federal states – was a misconception from the start. Here lies the huge difference between the US dollar and the Euro. Even though the over-indebted dollar is hardly worth the paper it’s printed on, it is still the common currency of the federal United States of America which has a common Constitution. The EU has no Constitution. There is only the neoliberal Maastricht Treaty which has no legal binding on any of the EU states. The euro is not sustainable, an analysis expressed by many international financial experts. 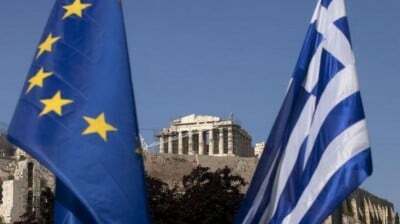 A future Greek Government may think twice whether it is a good idea to adhere to a failing and faltering currency, thereby remaining hostage to the predatory EU, led by Germany – instead of reclaiming her political sovereignty and economic autonomy. The new PM would also be well-advised, whatever decision she or he may take, to make sure it is backed by a Plan B. There is much to be gained from a new start, with a newly restructured Greek central bank and a public banking system that works actually for the Greek people, the Greek economy, rather than for faraway shareholders and insane boni of anonymous CEOs of nontransparent Wall Street and European financial conglomerates. Ms. Vassiliki Thanou, with her legal and institutional know-how, her female approach to Brussels infamous male arrogance, might just be one of the best-suited candidates to lead Greece out of her quagmire.